i adore it in green! b/c not only is green my favorite color but b/c i have a maternity dress i just bought for my 1 year anniversary that would look so amazing with this pop of green! Love the jewels! Great giveaway! I love it in White! I love the white the best- it looks great on you! How do you choose just one color?! I love it in coral. I've been combing through my wardrobe--accessories and all--and that's one color that I'm lacking!! I love the coral colored one!! :) I follow you! Ah, I woudl want green! Perfect for fall transition! I would love it in green! One of my favorite colors! Coral wins! And I don't need a reason...I just like coral :) Ok fine, how about because coral was one of my wedding colors? That's a good reason. I love the kelly green bib necklace! Perfect for fall! love this outfit! especially the shirt/necklace combo - mega cute! I'm obsessed with the coral! LOVE! I was going to go with white, but then I saw the green--it's gorgeous! Tough to decide between the coral or the white. I would probably choose the white because its so versatile and I don't have a lot of white jewelry. I just retweeted your giveaway link! Great giveaway! Definitely green for fall! Ohh, I LOVE the red lips and your strappy heels!! Hello beautiful, I did not know your blog. You look stunning as always!!! I adore the yellow necklace!!! Gorgeous! I love the white, I don't wear a lot of colors but the green ispretty cute too! I love the white! It goes with pretty much everything. I love all the colors! But my favorite has to be the Coral Adorned Bib Necklace!! Ooooo LOVE the coral one!!! Coral has been one of my favorite colors this summer. Green! Because it's my alma mater's colors! Hi Katie! !I love the white! !It matches with everything!! Beautiful necklace, I'd love it in coral! I love the white, it would be so versatile!!! I'd like to have coral one! I think it looks gorgeous on you in white so I would have to say white! I like Coral, Because it goes really well with turquoise which is my fav color to wear. I love the white! It can transition into fall easily and be worn year round, this would be a great addition to any wardrobe! Coral is such a trendy color right now adding a coral necklace is an easy way to wear the color. So my choice would be coral. I LOVE this necklace in Coral! I am just now getting comfortable wearing bold necklaces, it took me a while to get used to them on myself. This would a great addition to my growing collection. Coral can go with just about anything. Love your blog! I love the coral so much! I adore the necklace in green! It's the perfect color to go with all the new fall collections that are out now! Coral. Because I love coral! And I don't have any necklaces in the color. Really, I'd take any! All fab. Love the coral and white! Lovely! I would love it in white. Hard to pick a color !!! I think I would go with the Green to add a pop of color to my fall outfits ! I'm in love with the Coral beauty! The white looks great on you though! I IG'D it as well! Thanks! I love the green to transition into fall! I love the green as it would be a great transition piece for fall! I would love the green one! Green is in style for Fall and I think it would be the perfect accessory! I love the green because I have so many things that I combine it with! An other reason, I'm starting starting to experiment with necklaces, jewellery in general and clothes and you are giving me so much inspiration! Love the bibb necklace in yellow! That would make me instantly happy! Thanks for the giveaway! So cute! Love this necklace. 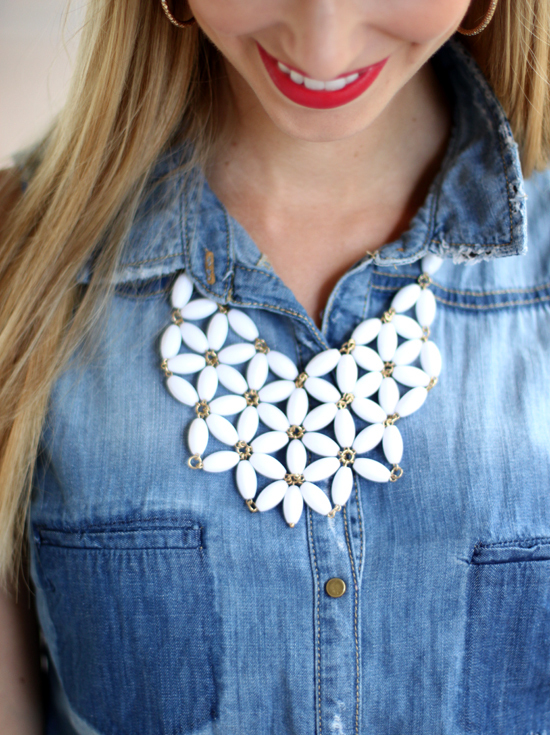 I am completely in love with the white bib necklace! Please oh please pick me! I would love the coral one.I love this color because it reminds me the sea!! So cute! I'd have to pick the yellow one because it would be the perfect nudge I need to break out of my color comfort-zone!! I would love the white bib necklace! I also liked them on facebook! I would love the white bib necklace! I also followed them on instagram! Coral for sure! I love that color like crazy this year! Great outfit and I love the green! I like the white because I don't own any white jewelry, and now that I see it on you, I really would like to add white jewelry to my little jewelry collection. Plus, you make it look awesome! I also love the shoes in the outfit you are wearing. Very cute! Love the bib necklace. I choose green!! I love the necklace in green! Oh man, I am ecstatic about the possibility of winning this necklace! I would definitely choose green - it's an easy choice, green is my favorite color! i just came across this blog and i'm already in love! the first post i ready being about a giveaway isn't too shabby at all. Hi I would like it in yellow. I have been looking for a yellow necklace. I like it in white. very classic. I love it in white because you could wear it with anything! I love that necklace! And the denim and black mix. I would love it in white! I love this outfit! White is simply chic! Love it! what an adorable combo - and i love the necklace!! I like the white bib necklace, because it can go with anything and reminds me of daisies! I love the white bib necklace! So cute! I love it in white. I love the coral. Nice pop of color. I love it in the white as it is a versatile color that can be worn with anything! I love the yellow necklace because it gives a unique pop of color! I love the green. It would be a nice color to pop with Fall clothing. Thanks for hosting this giveaway! I love the coral since it's my favorite color! Love the green, for sure! I love the way you styled it in white! So cute! What is your lipstick? It's the perfect red! 1. cute outfit!! and 2. I would love the green! love it in green! just looks fun and happy! Love love the GREEN one, my favourite color and perfect for fall! ;) Each and every piece is adorable, very hard to decide which one to pick! Love the royal blue necklace!! The green necklace, so pretty. i would love it in coral! I love this in coral, so pretty! I need that white necklace!!!! I love them all, but I think I'd have to go with yellow! On second thought, I need the coral necklace since it's not orange like the others! I have 5 of their necklaces! i love the white! they have suc cute products! Love the white! Whoever finally dispelled the myth that white is always for summer and hot weather is my hero! Love the contrast, it gives a fresh pop to anything and such a gorgeous frame for the face. And, of course, with a saturated mouth color....yum! Love your blog and enjoyed your recent "behind the curtain" post! Love how the white looks against denim. I'd choose kelly green mainly because I love green accessories! Absolutely adore the one in white! This is awesome! Just came across Cheerfully Charmed elsewhere and I love all of their stuff. I have to say, the yellow is my fave -- super sunshiny and happy. Color is a big thing this season - no more subdued tones for fall! While both the yellow and the green are fantastic colors (the coral is just a little too soft for autumn), I like the yellow best. It pulls out the bright fall hues in an eye-popping way. Love the necklace in white!! You look so great with this denim shirt. The white necklace pops (up? sorry for my English)! Oh my...LOVE it!!! I need more color in my jewelry collection, so I'd say coral! Went to the site...I'll be back to order...In Love!!! Ah, how exciting! I would totally choose the coral one. Would look so great with so many different colors - turquoise, black, white, ... anything really! Thanks for the opportunity! I love the coral one too but white goes with everything! I love the white one! It could go with so much! Fingers crossed! I love it in all the colors but if I had to choose just one it would have to be the white one. You've sold me on the white version. How pretty! I love the coral! I don't know why, I guess I am just a big fan of that color! I love the white one on you! But, my fav would have to be coral! Love a little color! I'm a new fan of your blog....love all your looks & outfits!! Cute necklace! I've been looking for a green statement necklace - so I'd choose green! white! love how you styled it! Love the white! Love your blog, too! I discovered your blog 2 months ago and check it every week. I really like the white necklace because it is a piece that can be mixed and matched with numerous different outfit options! Thank you for opportunity to win such a great necklace!! I think I really like the yellow! i love the coral! its such a happy color and can really go with anything! Ahhhh.....love all the colors! So hard to choose!! But think I would go with white, because there is endless possibilities to wearing it! Ohh I love the white one cuz it is simple enough to go with any outfit but still stand out! It's gorgeous in any color, but Kelly green does it for me. It's perfect for bringing the bright summer all the way into fall. I'm loving green jewelry lately, especially statement necklaces! I love love love the coral! I have so much I could wear with it! I posted about this on fb. Hope I win! Thanks! I love it in green! probably because I love everything in green.. it's my favorite color! I love it in coral. Coral is one of the most popular colors this year and for a good reason: Its beautiful, neutral and goes with everything. Coral, because I have a lot of clothes to wear with it. gorgeous necklace! i love it in white! I am loving the coral colored necklace because it would work easily with many outfits and it's a beautiful soft shade of pink! Thanks for the giveaway! i like it in white...it would match everything! Kelly Green for sure!!! love all the colors- i will definitely be back on Cheerfully Charmed sometime in the near future! I'd definitely pick the coral! I like the yellow to keep me smiling when my days may be gray. I'd love the yellow necklace! I love the white, it would go with everything! I LOVE the white....it adds a some "freshness" to any outfit. Thanks! I love the green!! It's my favorite color! Love the white one! I wear a lot of blues so the white would just pop!